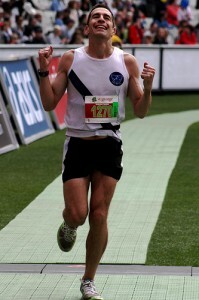 MUAC’s White Train has had a Sunday to remember, with some exceptional results at the Melbourne Marathon. The Melbourne Marathon, incorporating the Australian Marathon Championship, the Victorian Marathon Championship and the Australian University Road Running Championships was held on Sunday, 10th of October, starting next to Rod Laver Arena and finishing inside the MCG. The White Train had more than twenty athletes running in the three events, the full marathon, the half marathon and the 10km. Three MUAC athletes finished in the top 25 of the blue riband full marathon, with Nic Browne 13th in 2:28:56, Andrew Selby Smith 21st in 2:32:03 and David Paroissien 23rd in 2:33:34. This puts MUAC in a strong position to claim the Victorian Men’s Marathon Team Championship (subject to confirmation by Athletics Victoria). Kate Scarlett, MUAC’s Winter Manager, took 46th in the full marathon in 3:14:05 and was part of the winning Victorian Team that claimed the state team title. Harry Smithers put in a withering surge as he arrived at the MCG to take 2nd place in the 10km behind Australian representative Liam Adams and win himself a silver in the Australian University 10km championships. Sophie Barker claimed 5th place in the 10km in 37:03. Post race, the White Train enjoyed the sumptuous hospitality of the Melbourne University Sport marquee, with massages, drinks, lollies and a buffet offering a perfect start to recovery from the racing. Race analysis and recovery continued with a pleasant afternoon in Matt Irons’ Parkville backyard punctuated only cramps, cold beers and car crashes. 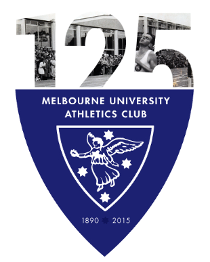 Australian University Distance Running Championships results.